Software challenges arose with new and evolving technologies. Imaginet helped one fast-paced energy services company develop custom Fleet Management Software that integrated their disparate systems, resulting in increased revenue and overall customer satisfaction. As one of the premier truck transportation businesses in this industry, this fast-paced energy services company faced continuous challenges with competitors, regulatory bodies and most importantly, their customers. 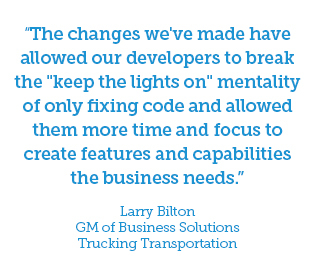 They had significant challenges with their existing truck dispatch and fleet management software, and they wanted to redesign their approach to software delivery, including the development process, technical architecture, and quality assurance. They needed to enhance their software development experience to address immediate business needs with new and evolving technology. This innovation would roll out to teams and customers all across North America. Imaginet was able to determine that the key issue in their software development was not a problem with velocity of new features, but rather a problem with the quality of the software delivered. Imaginet’s team tackled the client’s challenges and demonstrated the value of a holistic approach to organizational agile adoption. The development of fully functional Agile teams with full time business involvement. The capability to delivery business features bi-weekly. The delivery of high quality products. Improved business financial results due to delivery of aligned business features. Imaginet also provided Agile process coaching, technical mentorship, and software development support over a multi-month engagement. The results were dramatic and enabled this customer to increase the overall quality and speed of software development inside their organization. Furthermore, the software development team and business owners of the software became very connected, which greatly improved the business value of the solution. Imaginet was further engaged to architect and develop the business and technical integration for the new fleet management software. This integration included transportation logistics, dispatch, customer management, and PeopleNet (an in-cab tablet/OBC/Communication system) for a fleet of approximately 1,400 trucks across Canada and the US. Integration system handles approximately 65,000 orders per month. Development of industry-specific customizations for in-cab tablet software. Integration between existing document management (On Base), business intelligence and corporate reporting systems. Development of a custom fleet management dashboard.